When bamboo is heated at very high temperature in an airless vessel, it becomes charcoal. The vapour that comes off the heated bamboo is condensed to produce a liquid known as bamboo vinegar . Bamboo vinegar is produced in Japan and is used to treat eczema, atopic dermatitis, and other skin diseases, often by just adding it to bath water. Bamboo vinegar is acknowledged as an anti-inflammatory and anti-fungal, but not as a salad dressing. In Japan, bamboo vinegar is recognised as having many health benefits; eliminating foot odour, softening the skin, relieving itching and insect bites and improve blood circulation. Diluted, it’s also used as a skin toner and hair conditioner. In the West, bamboo vinegar is more commonly seen in form of foot detox pads . The pads are applied to the feet overnight. Bamboo vinegar detox pads score quite highly in the Amazon customer reviews. 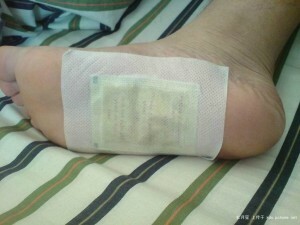 One purchaser said they felt 5 years younger the morning after a night with detox pads stuck on the feet. Another found his allergies reduced. Numerous reviewers commented on both the foul smell of the pads and the colour of pads in the morning. One of the claims made by manufacturers of bamboo vinegar detox pads is that the pads will turn a brown colour overnight and this is an indication that the detox pads are drawing out toxins through your feet. Indeed, numerous Amazon reviewers commented on the brown gunk they found on the detox pads the morning and were duly impressed by the efficacy of the product. There is an article on Mercola about bamboo vinegar detox pads. A reporter used the detox pads overnight and then took the resulting gunky brown pads to a laboratory for analysis. The results established that the chemical analysis of the used pads was almost identical to the new ones. The brown gunk appears whether the pad draws moisture from a person’s foot or is held over the steam of pot of boiling water. 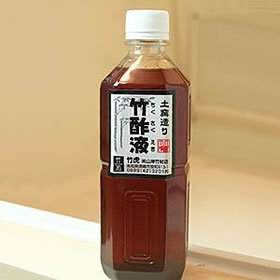 In its original form, medicinal bamboo vinegar was fermented for nine years. The sales script for the detox pads does not specify the age of the bamboo vinegar used for the pads. Still, the comments on Amazon make interesting reading. I do like the sound of the bamboo vinegar soap though. This entry was posted in All, Bamboo around the world, Food, Home and Health and tagged bamboo, bamboo charcoal, bamboo vinegar, bamboo vinegar foot detox pads, foot detox pads, health, Japan on 14/01/2014 by Deb.